It’s time for spring break! Maybe you’re going on a family vacation, or perhaps you’re staying home and letting the kids play with their friends. Regardless of your plans, your children are sure to have fun being away from school for the week. But be careful! Sometimes that fun can lead to unfortunate situations like a dental emergency. Your kids are taking a break, but you may need to stay alert in case you need to visit an emergency dentist in Louisville. Here are some common dental emergencies, how to handle them, and how you can prevent them in the first place. In many dental emergencies, time is precious and could determine the effectiveness of the treatment, so it’s important to act quickly and wisely. For the four examples mentioned above, there are certain steps you should take. 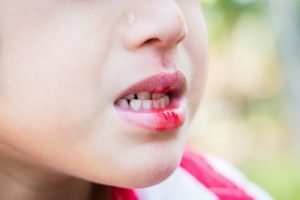 For a knocked-out tooth, call your children’s dentist in Louisville immediately and try to get there within an hour, if possible, for the best chances of saving it. Avoid touching the root and store it in milk or warm water if you can’t put it back in the socket. If your child gets a baby tooth knocked out, ask your dentist for guidance specific to your child. Toothaches are likely from decay that has penetrated deep into the tooth. However, try flossing around the tooth to make sure nothing is stuck, and then call your dentist for the next available appointment. Rinse your mouth with warm water to keep the area clean, and use over-the-counter medication and a cold compress on your child’s face to ease the pain. If you crack or break a tooth, call your dentist. Rinse with warm water and use a cold compress if your feel pain. For chips or breaks, try to gather the pieces of the tooth and bring them with you to the dentist. If an object gets stuck between your child’s teeth, use floss to get it out. Do not use sharp objects because they can damage your child’s gum tissue or scratch their tooth enamel. You can’t avoid all dental emergencies, but you can prevent some from happening. If your child participates in sports, particularly contact sports, have them wear a sports mouth guard. You can get a higher-quality, custom-fitting one through your emergency dentist in Louisville. Also, make sure your child has been maintaining good oral hygiene and is up-to-date with their dental checkups and cleanings. Although you can’t plan when, where, or how a dental emergency happens, you can plan how you will respond when it does, ensuring that you give your child the best chances of success in treatment. By knowing how to handle the situation, you can have a little extra peace of mind in case the unexpected occurs this spring break. Since opening in 1966, Remmers Dental has been helping families maintain their happy, healthy smiles. With three dentists on staff, patients have less wait time for dental emergencies and can often be accommodated the same day. Plus, many of the staff members are parents and know how to help children have positive dental experiences. To schedule an appointment with them, call (502) 499-0234 or click here.